Packet includes: 16 writing exercises, 30 categorizing exercises, and 2 extensive re-writing exercises. Description: This packet explains the differences among simple, compound, complex, and compound-complex sentences. The packet walks students through the process of combining simple sentences with conjunctions to create compound sentences and combining dependent and independent clauses to create complex sentences. Practice materials have students write different types of sentences and categorize different types of sentences. It also presents students with a list of simple sentences and ask them to create compound, complex, and compound-complex sentences by combining simple sentences. Finally, the packet gives students a paragraph, written with only one type of sentence, and asks students to rewrite the paragraph. Overall, the packet encourages students to do a range of work with different types of sentences with the goal of helping them to improve their writing by introducing sentence variety. Write “S” next to simple sentences and “C” next to compound sentences. Remember, compound sentences join two simple sentences with a coordinating conjunction (FANBOYS). ____2. Giant Frog protects tadpole. ____3. Frog likes candy and Giant Frog loves popsicles. The following sentences are ALL simple sentences (well, except one – find it and circle it!). 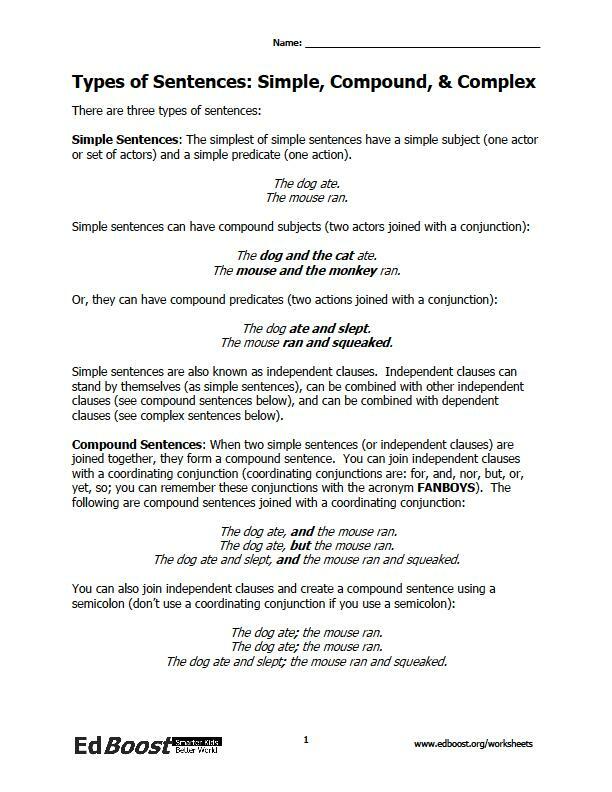 Combine the sentences (try to use each sentence only once) to make 3 compound sentences, 3 complex sentences, and 3 compound-complex sentences! Abraham Lincoln did not have much formal education. Abraham Lincoln was mostly self-educated. Abraham Lincoln became a lawyer. Abraham Lincoln got into politics. Abraham Lincoln is one of our most famous presidents. Abraham Lincoln was very tall. Abraham Lincoln usually wore a very tall top hat. Abraham Lincoln was very forgetful. Abraham Lincoln used to store important papers inside of his top hat. This packet strives to make sentence types understandable for students. But, it contains some difficult exercises and is best suited for students who are good readers, and have a basic understanding of grammar terms. Best for students in grades 5th and up.